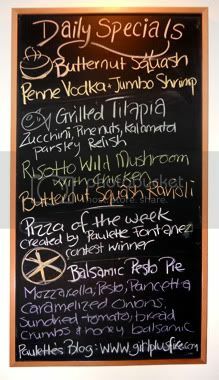 A few weeks ago a few bloggers picked my pizza as the upcoming Rosti Tuscan Kitchen Pizza of the Week. And that week was this past week! 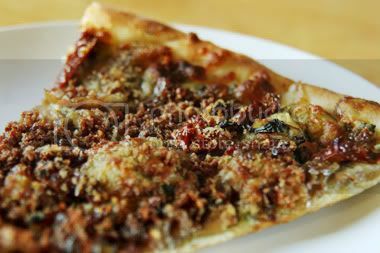 The Pizza of the Week is displayed on their Specials board, which means that everyone walking in the doors saw it up on their wall—as well as a shout-out to this here blog. So if you've found yourself here by way of Rosti's chalkboard, ¡hola! Rosti has two locations, so I had to try it at both (well, at least the toppings, since I hadn't asked for a gluten-free version). The pizza that was served was, of course, different than what I created. But that's the great thing about food: ingredient lists are guidelines. My original pizza was very cheesy. The pie at the Encino location came with extra caramelized onions while the one at the Santa Monica restaurant had far fewer. Everyone who tried it seemed to really enjoy it (or, at least, that's what they told me). It paired really well with the Coppola Diamond Zinfandel (that we ordered by the bottle—twice). We happened into the Encino location on Wednesday, when wine is half-price by the bottle. Lucky us! The recipe is as follows, sans quantities so you can tweak to your taste buds (and also because I didn't measure them when making it). It's good, I promise! And 11 food bloggers can't be wrong. 1. Pre-heat the oven to 400 degrees. Roll the dough out over a floured surface. 2. Soak the caramelized onions in the honey balsamic dressing. 3. Top the dough with a generous helping of pesto. Add the onions and the dressing marinade, along with the tomatoes, pancetta, and balsamic vinegar. Add a generous amount of shredded mozzarella, then top with a handful of bread crumbs. 4. Bake in a 400 degree oven for 10-15 minutes. Serve piping hot, being careful not to burn your mouth. I suppose you could use a pre-made crust, though recipes for making dough abound all over the internets. The pesto and honey balsamic dressing recipes are also up for interpretation since they are Rosti's proprietary creations, but those recipes are also available everywhere, even here. Rosti's contest is ongoing. You too can win bragging rights AND free pizza for a year. Go to their Facebook page for details. I'm so glad I met you at Rosti. Your pizza was SO good and I voted for you for first place. Congrats! Thanks, Lynne. It was definitely an experience, wasn't it?